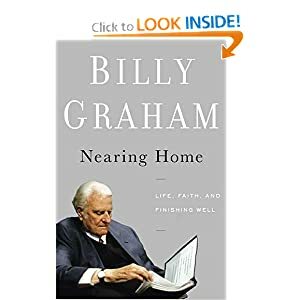 I'm 23 years old, but I have been wanting to read "Nearing Home" by Billy Graham now for quite some time. This book is simply stated: focused on living our final years for the glory of God. So often, people strive throughout their life to sacrifice and serve God, and yet somehow our culture tells us that once we hit the magical age of retirement, that our responsibilities have ended. We then desire to waste away those precious God-given years relaxing and doing what we most enjoy. Don't get me wrong, it is nice to spend time at ease, but I am confident that spending the next 20-30 years of our life on "vacation" is not how God intended us to use our precious days on earth. In his book, Billy Graham speaks with a peace and confidence about getting old in a way that makes you feel as if you are having a conversation with a friend. As he put it in his introduction, getting old is not a time "to be despised or a burden to be endured with gritted teeth (if we have any). Nor does pictures us in our latter years as useless and ineffective, condemned to spend our last days in endless boredom or meaningless activity until God takes us home." Even though I am considered young, I am very much enjoying this book! This is not just a book for the elderly. No in fact, using Billy Graham's own words, this book "is written for people at every stage of life - even those who have never thought much about growing older... the best way to meet the challenges of old age is to prepare for them now, before they arrive. I can not recommend this book more highly! I would encourage people of all ages to read and discover what the Bible says about growing old and nearing home!